Debut of our new section “This Space Here” featuring an excerpt from Lawrence Paul Yuxweluptun’s “Artist Statement.” Articles by Richard C. McCandless, Mary Leah de Zwart, Duane Thomson, and David Bell. David Bell discovered Minnie Sharp’s 1919 “autobiography” forty years ago and he has dabbled in her story, and that of her husband Tappan Adney, ever since. A law professor at the University of New Brunswick (Fredericton), his usual work is on the colonial Maritimes. Mary Leah de Zwart is a sessional instructor and cohort advisor for the Home Economics: Human Ecology and Everyday Life master of education program at ubc. She holds a PhD from ubc and lives in Vernon, BC. Her research interests include women’s history, home economics pioneers and food history. Richard McCandless, a past contributor to BC Studies, is a retired senior BC government public servant with a continuing interest in history and public policy. Bonita Russell is a member of the Faculty of Management at Vancouver Island University in Nanaimo, BC and has her own consulting business. She is also a Master Knitter. Hilary Russell has a BA in women studies and knits in her spare time. 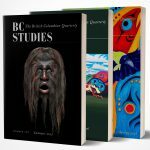 Duane Thomson is an Associate Professor Emeritus of History at UBC Okanagan whose field of interest is relations between First Nations and Europeans in British Columbia. He consults on land claims issues in the BC interior, the Fraser Valley and the Gulf Islands. His current passion is to raise money to develop the Okanagan Rail Trail, which will become a wonderful asset for the Central Okanagan and North Okanagan communities and an attraction to cyclists and pedestrians, locally and internationally. Jim Wood has taught at several post-secondary institutions, including Trent University, the Royal Military College of Canada, UBC Okanagan, and the University of Victoria. In addition to articles published in BC Studies, he has published articles in Canadian Military History, The Journal of Military History, and The American Review of Canadian Studies, His book publications include We Move Only Forward: Canada, the United States, and the First Special Service Force, 1942-44 (2006) and Militia Myths: Ideas of the Canadian Citizen Soldier, 1896-1921 (UBC Press, 2010). He currently teaches history at Okanagan College and UBCO. Jo’Anne Yearley is a retired faculty member of Vancouver Island University. She received her Master of Nursing from the University of Victoria. She enjoyed a forty year nursing career in various roles; as a direct care provider, a nursing administrator, and a university-college professor. Jo’Anne now advances her knowledge and passion for fibre arts through weaving, spinning, and knitting as a member of the Tzouhalem Spinners and Weavers Guild. Lawrence Paul Yuxweluptun graduated from the Emily Carr School of Art and Design in 1983 with an honours degree in painting. Yuxweluptun’s strategy is to document and promote change in contemporary Indigenous history in large-scale paintings (from 54.2 x 34.7cm to 233.7 x 200.7cm), using Coast Salish cosmology, Northwest Coast formal design elements, and the Western landscape tradition. His painted works explore political, environmental, and cultural issues. His personal and socio-political experiences enhance this practice of documentation. Yuxweluptun’s work has been included in numerous international group and solo exhibitions, such as INDIGINA: Contemporary Native Perspectives in 1992. He was the recipient of the Vancouver Institute for the Visual Arts (VIVA) award in 1998.